I’ve been to Bad Hollow ten times, but I still don’t know how to get there. The trailhead is at a secret location at the end of a series of roller-coaster roads snaking through the spectacular Fall colors of Brown County, Indiana. A rutted lane ends at the bottom of a steep hill where we parked our cars this past weekend. 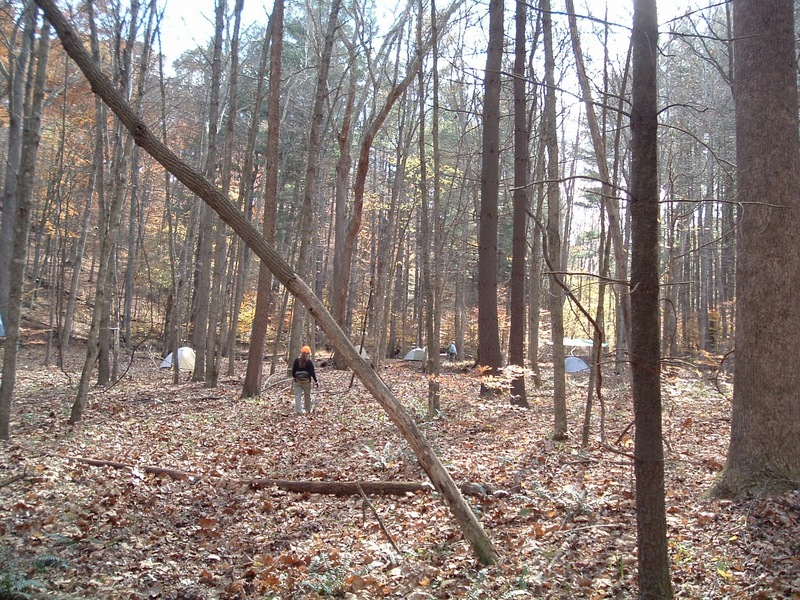 Our group crossed private property to find the overgrown trail on the edge of the vast Hoosier National Forest. Our intrepid leader, Fred, got permission in 1994 to use the hidden trailhead and has explored and memorized the trails, ridges, and creeks each Spring and Fall ever since. The trails crisscrossing our section of Hoosier are not marked with blazes and have precious few signs. Instead, Fred points out “Mary’s rose bush” or “the Big Tree” to indicate the correct turns. Fred celebrated his 70th birthday years ago and now encourages group members to memorize the route to Bad Hollow so the tradition can continue. Several hikers whipped out their GPS units. Though I’m a minimalist and generally frown upon intrusive electronics in the wilderness, having a reliable GPS mapping the way is a comfort. For seven miles I huffed and puffed up and down hills and gullies following the sturdier legs of eleven other hikers, all laden with 22-45 pounds of gear in their backpacks. Bright blue skies and fifty degree weather made for perfect hiking. The views through the thinning tree tops was thrilling, but the carpet of leaves hid roots, acorns and rocks, and created uncertain footing. We took turns falling.Bad Hollow is a lovely narrow valley thick with pine, maple, and paw paw. A stoney creek meandering through our camp provided water for our two-night stay. The water was scant this season and went under ground for hundreds of yards, so we positioned our fire ring in the dry creek bed. Clustered around the heat of a good blaze is how you get to know your fellow campers: the retired doctor who is building a cabin on the Alaskan permafrost; the brilliant lesbian teacher; the engineer who also dives to collect fish for Chicago’s Shedd Aquarium; the ex-state’s attorney with crime stories enough to fill the cold evening hours. We had left homes, careers and loved ones back in civilization to subject ourselves to strenuous exercise and temperatures below freezing. Each of the twelve hikers gathered at that fire agreed that the scent of wood smoke clinging to our jackets and permeating our closets back home is a pleasure. Each understood the others’ innate need to be out in nature, our uniqueness, perhaps oddity. The beauty and solitude of Bad Hollow drew us into the wilderness. That campfire made it our home. 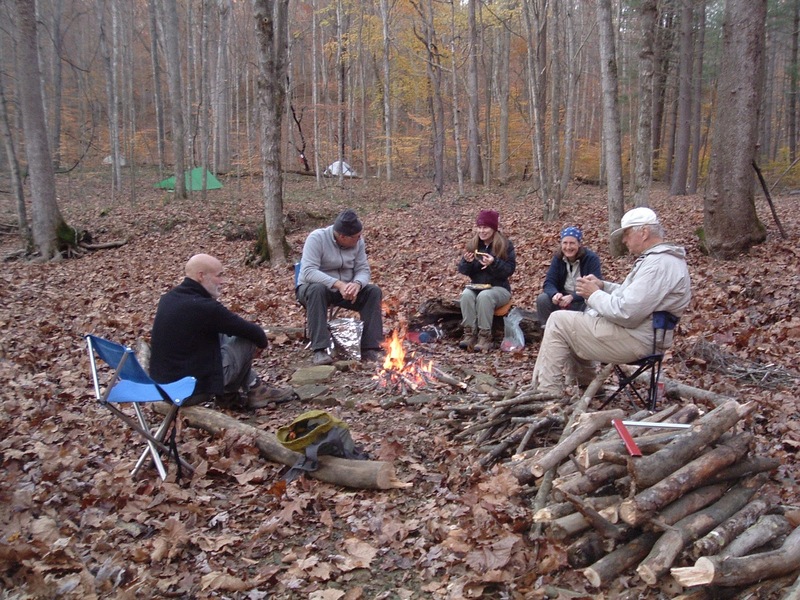 PS: While mesmerized by the flames, I concocted mystery scenarios in my head and envisioned characters based on the friends sitting around the campfire, or maybe the local eighty-year old hiker we had met earlier that day who left us in his dust, or the turkey hunters in blaze orange. Should I tell them they may be in a novel? Do you base your characters on real people? Do you ask their permission?